The first round of Egypt's first genuine multi-candidate presidential election has come to a close – largely without incident – after two days of voting. As was the case on the first day of voting, Egypt's Supreme Presidential Electoral Commission (SPEC) extended voting hours by one hour to 9pm to accommodate anticipated high voter turnout, especially given that Thursday had been declared a national holiday. Voters chose from among 13 official candidates representing three principal ideological fronts. The left is represented by increasingly popular Nasserist candidate Hamdeen Sabbahi. Principal secular candidates, meanwhile, include Ahmed Shafiq, ousted president Hosni Mubarak's last prime minister; and Amr Moussa, a Mubarak-era foreign minister and former Arab League chief. Key Islamist candidates include former Muslim Brotherhood leader and moderate Islamist Abdel-Moneim Abul-Fotouh; and the Muslim Brotherhood's Mohamed Morsi. Egyptians have not participated in presidential elections since 2005, when Mubarak attained a whopping 87 per cent of the vote (6.3 million votes), in polls widely perceived to have been rigged in his favour. According to SPEC head Farouk Sultan, total voter turnout for the elections stood at roughly 50 per cent. According to reporters on the ground, turnout appeared high in urban areas of the country. In more affluent middle- and high-income districts of Cairo like Maadi and Heliopolis, fashionably dressed voters enjoyed free croissants. 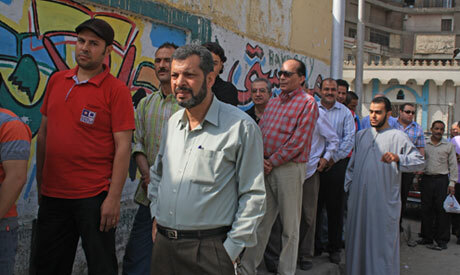 Judges in Cairo, however, voiced their disappointment with turnout figures. Judge Hisham Raaouf, for his part, head of the Cairo Appeal court, said he had not expected "such a low turnout." "We had anticipated higher turnout figures than those seen in last year's parliamentary elections, but this didn’t happen," he said. "This suggests that many Egyptians are dissatisfied with either the electoral process or the presidential candidates themselves." In rural areas of Egypt, voter numbers appeared even lower. Two villages in Upper Egypt boycotted elections to protest months-long shortages of bread and butane gas. There were almost no reports of electoral violence on the second day of polling. Nor were there many reports of electoral violations. According to the SPEC’s Sultan, reports of electoral breaches on Thursday were much lower than on the previous day. That being said, the Cairo-based Egyptian Organisation for Human Rights (EOHR) issued a report on Thursday detailing alleged electoral violations – namely vote buying – in seven governorates by campaigners for presidential candidates Mohamed Morsi, Ahmed Shafiq and Abdel-Moneim Abul-Fotouh. The EOHR alleges that votes were sold at prices ranging from LE50 to LE150 in the governorates of Alexandria, Marsa Matrouh, Sharqiya, Giza, Cairo, Qena and West Fayoum. According to EOHR officials, such violations represent a clear infringement of Egypt’s law on political rights, which calls for a one-year jail sentence – and a fine of LE10,000 to LE100,000 – for anyone found guilty of the practice. And according to the Cairo-based Arab Network for Human Rights Information (ANHRI), campaigners for Morsi and Shafiq were caught trying to influence voters in the south Delta governorate of Menoufiya. ANHRI also alleged on Thursday that large-scale campaigning for Morsi was still underway – a clear violation of the ban on last-minute campaigning – in several governorates. Limited incidents of violence, meanwhile, were reported in the northern port city of Damietta between Morsi and Moussa supporters. Brawls were also reported in Sabbahi’s hometown of Kafr Al-Sheikh between his supporters and security personnel over campaign advertisements outside polling stations. In terms of voting trends in Cairo and other governorates, observers still say it is too early to predict final results, especially since many voters appeared to make up their minds at the very last minute. Voting patterns in Cairo's more affluent areas appeared to be similar to those on the first day of the vote. Zamalek voters, for example, seemed to demonstrate a preference for secular candidates Shafiq, Moussa and Sabbahi. In the upscale 6 October City on the outskirts of Cairo, numerous voters voiced support for Shafiq. Hamada, a young hairdresser, said he would vote for the "corrupt" Shafiq in order to ensure his "bread and butter." His modest staff – receptionist Sameh and worker Mina – echoed these sentiments, saying they, too, planned to cast ballots for Mubarak's last prime minister. "If an Islamist becomes president, I'll lose my job because hairdressing will become forbidden," said Hamada. "Our revolution was stolen." According to reports, working-class districts seemed to show a preference for Islamist candidates and – too a lesser extent – Shafiq and Sabbahi. In the low-income industrial Helwan district south of Cairo, an area inhabited mostly by public-sector industrial workers, the Brotherhood's Morsi appeared to be the candidate of choice. "Morsi is very popular here because people want to live a life not surrounded in sin," said Helwan resident Hala Mahmoud. "We want the new president to be from the parliamentary majority so he can achieve all his plans," said ceramic worker and Helwan resident Mohamed Moslemany, in reference to the fact that the Brotherhood's Freedom and Justice Party holds the majority in parliament. Sabbahi also appeared popular in Helwan. Notably, one Morsi campaigner said: "Morsi has a good chance in Helwan, but so does Hamdeen Sabbahi." "Sabbahi is close to the people, especially the poor," asserted one Helwan resident. In the Nazlet El-Semaan district, near Egypt's historic pyramids, the Brotherhood candidate's popularity was evident, which locals attributed to his religious piety. "He knows God and we want someone who fears God," said 40-year-old horseman Abdel-Aziz Abdel-Rahman, echoing a phrase often heard at Morsi campaign rallies. Several of Abdel-Rahman's colleagues, however, voiced a preference for secular Moussa, while Sabbahi appeared to enjoy the support of more elderly voters. In Giza, meanwhile, voters were less willing to divulge their preferred candidates. "Women from impoverished areas are very careful not to talk openly about whom they will vote for," reported Ahram Online's Salma Wardani. "But after the vote, they ask each other about their choices." Outside the capital, voting trends were no easier to ascertain. In Alexandria, often seen as an Islamist stronghold, showed a preference for Morsi. Reports seemed to indicate that, although the Salafists claim to be backing the more moderate Abul-Fotouh, they are in fact throwing their weight behind Morsi. "The Salafists are backing Morsi not Abul-Fotouh," said one observer in the coastal city. At least one Alexandria resident – the mother of slain revolutionary icon Khaled Said (whose murder by policemen in 2010 was seen as having contributed to last year's popular uprising) – is voting for Sabbahi. "Sabbahi can ensure the rights of the martyrs and injured of the revolution. He also has a good chance of winning," she told Ahram Online. "Sabbahi is neither from the old regime nor from the Brotherhood. He would represent an important step towards change." In the Nile Delta governorate of Sharqiya, Shafiq's home territory, Ahram Online reporter Adel Mahmoud said that Shafiq appeared to be sweeping the vote, followed by Morsi, Abul-Fotouh and Sabbahi. In the Upper Egyptian Qena governorate, meanwhile, Al-Ahram correspondent Mahmoud Dessouky reported a discernible lack of enthusiasm among voters. He added: "Campaigners for Morsi's Freedom and Justice Party, Abul-Fotouh, Sabbahi, leftists, revolutionary youth groups and the Salafist Nour Party have agreed to help dissuade large numbers of illiterate men from voting for Shafiq." In Port Said, at a major polling station in which some 90 per cent of the women wore the niqab, voters showed a distinctly Islamist tendency. Younger voters, however, appeared to be partial to Sabbahi. After polling stations closed at 9pm local time, the meticulous process of vote counting began. Individual polling stations immediately began releasing official vote counts, and results of Egypt's first post-Mubarak presidential poll, will become known within coming hours.